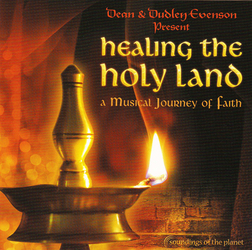 Healing The Holy Land CD is a deeply moving collection of sacred chants and songs from Jewish, Christian and Muslim music of the Middle East brought together in a spirit of peace. The music is timeless and is an inspiring album that will appeal to anyone looking for a more universal approach to the sacredness of religious holidays. This gorgeous collection of music features world-renowned vocalists and musicians and merges the ancient devotional singing of the Middle East with stunning contemporary arrangements. Many interfaith groups have asked for appropriate music at their celebrations. Healing the Holy Land CD will be enjoyed at many public gatherings!